Move vs Kinect: which is better? Later this year both Sony and Microsoft will release motion control devices that they hope will not only enhance the gameplay experiences on their consoles, but also eat into the Wii's motion-controlled mass-market dominance. Sony has the PlayStation Move controller and accompanying Navigation controller, UK release date 15 September. Microsoft has cooked up something a little more space-age with Kinect, a full-body 3D motion-sensing camera, out with a UK release date of 4 November. 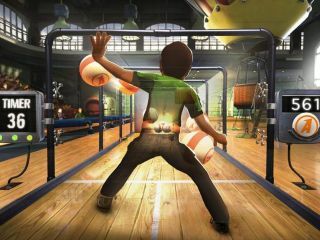 The Move vs Kinect video below has been created by our colleagues on T3.com. Both have motion control at their cores and yet they're vastly different devices, giving gamers a decision to make come the holiday season. Just the differences in the way they detect your movement mean they offer completely differing experiences. So, Kinect vs Move: which one is better? Having played early versions of games to appear on both devices, we attempt to make the decision easier for you by weighing up their very distinct pros and cons. We've already done detailed write-ups on the technology powering the PlayStation Move and Microsoft's Kinect, so nip over to those if you need a real techy run-through. Here, we'll be a little more brief. Sony's Move controller takes obvious influences from the Nintendo's Wii – it's shape and button configuration, not to mention the accompanying Navigation controller with its analogue stick, all closely resemble the Wii Remote and Nunchuk, minus the wires and plus a few extra gizmos. The combination of tilt, movement and orientation sensors inside the Move, plus that glowing orb on top which is detected by the PlayStation Eye camera make this a more precise device than the comparatively clumsy Wii Remote. Kinect on the other hand leaves you completely hands-free, detecting the movement of your entire body using an array of multiple cameras and depth-perceiving sensors to see your movements in 3D. That means, in theory, it knows where all of your limbs are at all times and can portray your every move in the virtual world. It's the most basic question; how accurate are they? We can tell you right off the bat that our experiences with the Move have thus far been flawless. It seems completely free from the clumsiness and errors that occur too regularly with the Wii Remote. The glowing orb on the end of the Move controller can be tracked within a millimeter of its position. Not just on a 2D plane but distance too – the larger that orb appears to the PS Eye camera the closer the PlayStation knows it is. And any time the camera can't see the orb, those sensors in its body effectively take over. There's also no risk of the orb blending in with anything in the background – the PS3 will monitor your surroundings and prompt the orbs to glow any one of over a hundred different colours so that it contrasts suitably. Although there's no way of knowing if another bright light source in the background could momentarily confuse the PS Eye until we test it thoroughly, its certain to be far more reliable that the Wii Remote's IR sensor (that top panel that sees the Sensor Bar on your TV), which is sensitive to everything from candles and lighters to Christmas lights and even sunlight. We had no issues using Move on a busy expo show floor. Kinect admittedly has the tougher task of tracking your entire body with no visual aids whatsoever - no pin-on lights and no handheld sensors. And we were somewhat disappointed to see that the difficulty of such a feat is evident in the device's occasional hiccups. A Kinect racing game, Joy Ride, had us holding our fists in front of us and spinning them in circular motions as if we were clutching an invisible steering wheel. It works, most of the time, and is very impressive when you turn your first corner and realise how far videogames have come since the stiff joystick and single red button inputs of the Atari 2600. But then you overshoot a bend and desire a steeper turn. Your instincts tell you to rotate that virtual wheel more aggressively, and that's where Kinect goes wrong. We found that if your fists pass the 90-degree turning angle the game gets confused and sometimes steers in the opposite direction. It was almost like the game was only tracking our fists and not our entire arm, because if it was it would see our arms unmistakably coiled in a particular direction. We tried a bowling game on Kinect too. Large limb movements appeared to work perfectly – thrusting our bowling arm forward at different speeds resulted in equivalently paced bowls. It was greatly satisfying. But it seemed to struggle with detecting our smaller movements – such as the twisting of our wrist to put spin on the ball. We tried repeatedly, starting with subtle twists and then large over-exaggerated flicks. Sometimes the ball span, sometimes it didn't, but we couldn't detect any kind of consistent recognition of our ball-curling intentions. It just wasn't acting the way we wanted, and that's with all our understanding of motion tech and our greatest efforts to accommodate multiple possible parameters of its detection abilities. We wonder how the not so technically-minded mothers and younger children will get along with it.